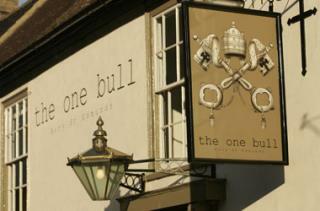 The One Bull is now serving nitro-coldbrew coffee on tap and we believe that we are the first pub in the UK to do this. We have teamed up with craft roasters and coldbrew brewers, Frank and Earnest, who create nitro-coldbrew here in Bury St Edmunds. Nitro-coldbrew is served through a beer font and we are well known for being passionate about our coffee and our beer. We see it as a great opportunity to offer such an unusual and high quality product in a pub environment and it is part of our ongoing commitment to source and offer great quality non-alcoholic drinks alongside our alcoholic drinks range. Frank and Earnest’s cold-brew coffee is single origin and is produced from freshly roasted speciality coffee, steeped in filtered water for 18-20 hours. Heat is replaced with time resulting in lower acidity and a cleaner, sweeter finish. A double filtration process is used to create a perfectly clean and crisp brew. Nitrogen is then added to create a smooth mouthfeel and a creamy stout like head.